I've been to Chicago many times before but this journey was filled with "firsts". It was the first time that we took the train instead of driving. 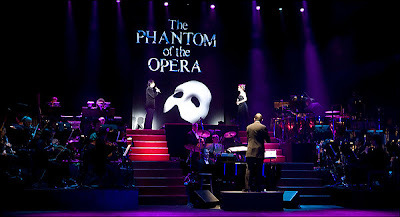 It was the first time I attended the final performance of a long-running show. It was the first time I mistakenly hailed a police car instead of a taxi and was the first time I found myself flat on my back on the sidewalk looking up at a sea of faces and hearing people yelling "Call 911! Call 911!". It only strengthened my opinion that Chicagoans are some of the most helpful people in the US. We live within a six hour drive of Chicago and have always driven there. In the past our winter trips have sometimes been fraught with slippery and snowy road conditions. This has been an unusually bad winter already, which helped us to decide to take the train on this junket. I've taken the train many times in Europe, but seldom here in my home city. I was surprised that the ticket price was reasonable, which made the travel cost comparable to driving; even cheaper when we factored in the cost of valet parking at the hotel. There were a few positive aspects to taking the train and more than a few negative. As I said, the comparable price was a plus, as was the ability to sit and read and move about while enroute. All the Amtrak personnel were extremely helpful and friendly. On the return trip we were surprised to be taken out of the line of waiting passengers and shuttled directly down the tracks to our door on a motorized cart. Our luggage was taken on and stored for us. On the negative side was waiting in a cold shelter in Birmingham for the train to arrive, crying children, sneezing passengers, unexpected delays, incessant stops and subsequently a much longer travel time. It took us the better part of the day to arrive and we were tired from the long trip. Next time we would definitely drive again to Chicago, unless weather conditions prevented it. Our hotel, the Embassy Suites on Columbus Ave, was comfortable and well located. We had two queen sized beds and a living room complete with flat screen TV. The hotel offered a daily cooked to order free breakfast and an afternoon happy hour with free drinks and snacks, which we were able to enjoy the first night since we didn't have theater plans for Friday evening. We had late dinner reservations at Le Colonial on Rush Street. I'd been there three times before and enjoyed it each time. The cuisine is French/Vietnamese and the decor is colonial Southeast Asia from the 1920's. 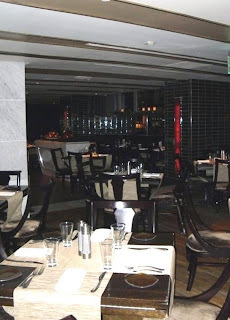 The food is fresh, light and flavorful. My favorite was the tuna tartar appetiser. The next morning was the day of the fateful second "trip". We awoke to a brilliant blue sky and nippy zero degree temperatures. Not to be discouraged, we set out on an exhilarating hour long power walk to Navy Pier and back. The juxtaposition of the deserted summer recreation spot, the huge empty ferris wheel and the ghost-like pleasure boats with the frozen lake and the snowy backdrop of the skyscrapers made me wish I had not forgotten my camera in the hotel room. 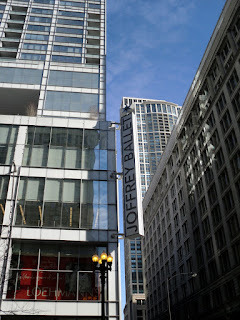 We returned for breakfast at the hotel and changed for a shopping excursion on Michigan Avenue. We browsed through Nordstroms, Macy's and made some purchases at Marshalls. 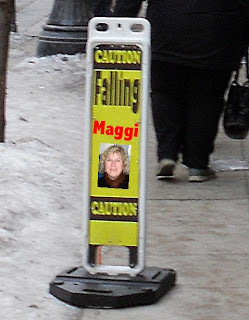 It was then, strolling casually down the sidewalk that my heel started to slide forward. I watched in horror as my leg continued to stretch in front of me until I was doing the splits worthy of a Dallas Cowboy cheerleader. I was unable to stop the slide and I landed on the ground in the most severe pain I have felt since childbirth many years ago. As I lay there, unable to move, I could see and hear a crowd forming around me. And I could see Jan's terrified face looking down at me. People were shouting for 911 and I was pleading for them not to call them. I wanted to be left alone and wait and see the outcome. A woman looked down at me and said, "We're doctors, can we help?" I turned them down as well. Jan tells me I must have laid there for 15 minutes, until a very nice young man from the Garmin store we were in front of offered to help me get up and get me inside to rest. He and Jan managed to get me up, but I started to see black spots and was afraid I'd go down again. Slowly, they managed to get me inside and on a couch. Back at the hotel I spent the afternoon resting, unwilling to let the injury spoil our weekend. *A postnote: I found out when I returned home that I had badly torn my hamstring muscle and I'm in for a long recovery. 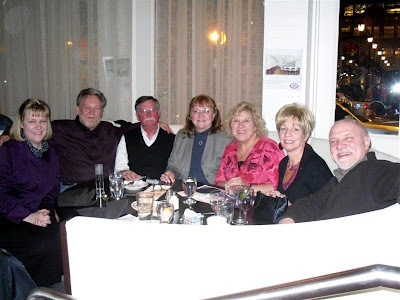 We had reservations that evening at a renowned seafood restaurant called Catch 35 and tickets to the next to last performance of Wicked at the Ford theater. I can't remember what I had for dinner, not because the restaurant wasn't excellent, but because I was probably still in a bit of a shock from what had happened earlier. 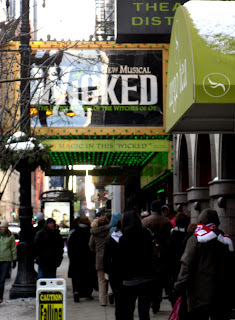 "Wicked" was wonderful, as usual. Jan and I had seen it a few years ago on Broadway with Kristin Chenowith and Idina Menzel and Jan has been hooked ever since. I love it too and we subsequently saw it several other times together. It was ending its four year Chicago run this weekend and that was whole reason for this journey. It remains one of my favorite shows (even though it is not an Eric Kunze show - haha). Each time you hear and see something you didn't notice before. The next morning, sadly, didn't include a power walk for me. By this time the back of my thigh was purple and blue. We had tickets for the last performance of "Wicked" at 2:00, so I sent Jan off to complete her shopping while I lazed on the couch with some light reading. The final performance was very emotional. Each time an actor appeared onstage for the first time the entire audience erupted in wild applause. It was obvious everyone in the sold-out crowd was there for sentimental reasons. When Glinda and Elphaba hugged at the end of "For Good" they embraced for such a long time during constant clapping from the audience, I actually got teary. I remember those emotions from my years in community theater. The last show is always very heartbreaking. You can't imagine life without these people you have grown to trust and love. I can't fathom what that must feel like after four years together. There was a well-deserved, long and enthusiastic standing ovation for them all, followed by a thank you by the producer of the show. Our reservations that evening were at Brazzaz, a Brazilian steakhouse. I had deliberately planned to come here after the theater that day, because I knew we would want to really take our time and sample all the possibilites. The salad bar was one of the best I have seen. It included oysters on the half shell and the best ceviche I've ever had. The waitress brought us a basket of tiny hot cheese popovers that were addicting, especially to someone who has been off of carbs for a long while. Waiters dressed in gaucho outfits came around with spears of succulent proteins: lamb, beef, shrimp, filet wrapped in bacon, chicken. One of our favorites was the grilled pineapple, sliced fresh and hot. The sweetness of the pineapple was a perfect foil to the savory meat. We ate too much, of course, but Jan insisted we try the traditional after dinner drink, made from 43 ingredients, appropriately called Licor 43. It is served from a bottle frozen in a block of ice decorated with various fruits. We both agreed our husbands would love it here and purposed to come back some day soon. Check out another of my blogs about my Austrian cousins, Horst and Gernot Turnowsky, i.e. "The Bike Twins". 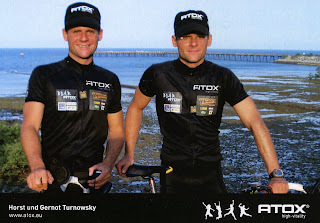 They pursuing numerous world records in biking and mountain climbing. They are already in the Guinness Book of World Records! During the performance, the lady sitting next to me didn't know my attachment to Eric, yet leaned over to say, "He's the best one in this show." Each of the performers were really excellent, yet I had to 100% agree with her. Eric sang with HEART. Here is an excerpt of "Too Much in Love to Care" from Sunset Blvd. The reason for the trip was the same as the last four trips I've taken this year: to see Eric Kunze perform. He is such an extraordinary talent and such an exceptional human being that I don't want to miss any of his appearances. Luckily, my friend Jan feels the same way and we were able to convince our husbands to join us. The opportunity enriched all four of us with a chance to get to know one another better and enjoy a unique experience in a fantastic venue: the Eisenhower Theater at the Kennedy Center. Along the way we took fans from the Eric Kunze fansite and my girlfriend Ingrid and her husband Jake along for the ride. 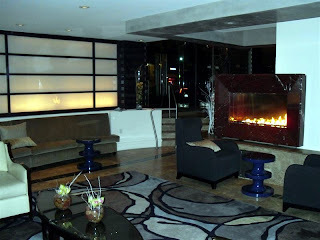 My quest for a great hotel in a perfect location was rewarded when I found the Hotel Palomar in Dupont Circle. The hotel itself was everything I look for in accomodations: modern, artsy, interesting, cool and affordable. We hit the jackpot! Those requirements were immediately apparent upon entry of the hotel. There was a gathering area to the right with modern couches, coffee tables and a two-sided fireplace. At 5:00 each day there was a free wine reception here. the reception personnel went above and beyond to find us adjoining rooms. The rooms themselves were huge. 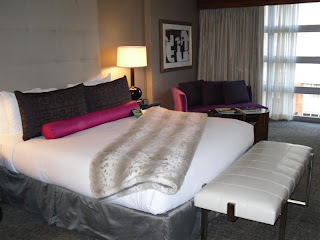 We had an extremely comfortable king sized bed with a faux animal print throw, flat screen TV, couch, coffee table, office area with free wireless and a closet in which hung animal print terry cloth robes and (for purchase) camisole pajama sets. Since we had adjoining rooms, we kept our door open most of the time, thereby doubling our space. We arrived early in the day and were able to check in immediately and relax. The hotel restaurant, Urbana, was reputed to be good and we decided to eat dinner there before heading to the Kennedy Center for that evening's performance of Legally Blonde. We couldn't believe our good fortune. What a great restaurant! The food, the service and the prices were perfect. We were to eat there twice more during our short stay. Legally Blonde was a pleasant diversion. The highlight was whetting our appetite for the following evening's festivities. The weather was beautiful and we enjoyed the full moon, the fountains and our view of the Potomac River from the back of the Kennedy Center. In hopes of surprising Eric, we went to the stage door and waited. Finally, I texted his mobile and he called back immediately saying he was already in his hotel room. He was sorry to have missed us, but we made plans to meet the following night after the performance. Earlier in the day we had stocked up on beverages and snacks and we went back to the room and gathered in our room for an afterglow. Today was the big day: New Year's Eve. We didn't undertake much so as to conserve our energy for a late night. 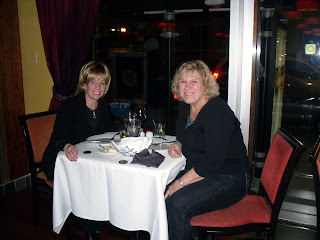 We did have reservations that night at Urbana (again) for a special prix fixe New Year's Eve dinner. 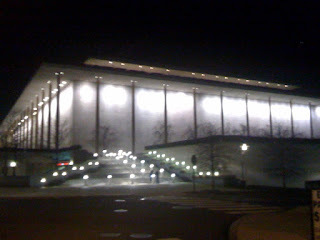 We took a cab to the Kennedy Center and arrived at about 7:15. I had communicated via email regularly with Lio and Laura from the fansite regarding our plans for the evening. They were beyond excited about the performance and hopefully meeting Eric afterward. Laura had brought her friend Jeannie along. We all met at the Kennedy bust in the lobby at the Kennedy Center beforehand. They recognized me immediately from photos on the fansite. We got along amazingly well, considering we had just met. Soon it was time to go to our seats. The Eisenhower Theater was a beautiful venue. I knew we would be sitting close, with our front row tickets, but we weren't prepared to be sitting so close we could practically have touched the performers. Since the orchestra was onstage, the orchestra pit in front of us was covered and they came almost right to the edge during some of the songs. 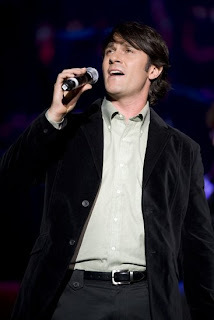 "The Music of Andrew Lloyd Webber" started with music from Jesus Christ Superstar and we didn't have to wait long for Eric's signature number, "Gethsemane". I had heard him sing it on YouTube many times, but this was so thrilling the hairs stood up on the back of my neck. I could see others in the audience looking at each other incredulously. 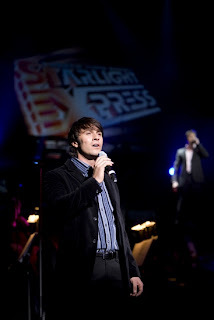 Someone commented to me later that Eric was the gutsiest singer they had ever heard. Someone else had mentioned his "go for broke" style. I was so proud to be in the same room with him. The rest of the concert was very good as well. Each of the other five performers were extremely talented in their own right and the order of the songs flowed well. The night passed very quickly. 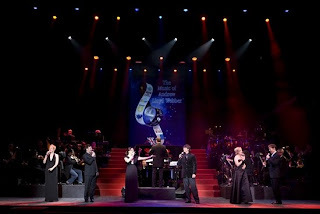 At the end of the concert the clock was nearing midnight and the cast came to the front of the stage for an encore song. 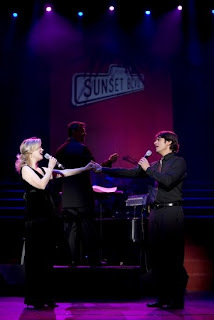 It was "The Perfect Year" from Sunset Boulevard, which they sang to the audience. At the last line, Eric extended his hand down to us in the front row and said smilingly, "Happy New Year". It was a thrill. I met Eric almost exactly one year ago after a performance of Whistle Down the Wind in Detroit on January 9th. And this was a perfect end to a perfect year. After the concert we tried to find our way back to the Kennedy bust in the lobby; our preassigned meeting spot. Little did we know we would be battling a thousand other theater-goers, who were toasting their champagne glasses, dancing or milling about. The seven of us did manage to meet, but it became apparent that Eric was not going to be able to find us. He was feeling the same thing: I got a text to that effect. Thank God for cell phones! He was still at the far end where the theater was. I muscled my way through the crowd ("like a Lion's linebacker", Paul exclaimed) with my entourage following in my wake. 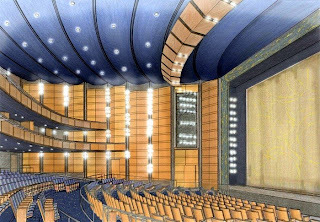 At the other end of the Grand Foyer, we searched the sea of faces, until Jan yelled "there he is!" and I finally saw him at the other side. He saw us too and we met, joyfully hugging, to be able to wish each other a Happy New Year in person. I had bought little cans of sparkling wine with straws attached and we all got one to toast each other. Lio and Laura were each able to have their time to chat with Eric. Eventually, Georg, Paul and Jeannie finally caught up with us to say hi to him as well. We all floated home that evening (well, Jan and I did anyway) with the beautiful music ringing in our ears. We stayed up really late rehashing the evening's events and enjoying cocktails in our room. The next day we did a little sightseeing around DC. 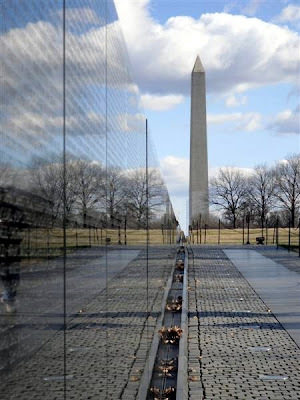 Georg had not been to the Vietnam Memorial. It is a sobering place. No one of our generation has not been touched by the loss of someone we either knew directly or indirectly from that time. 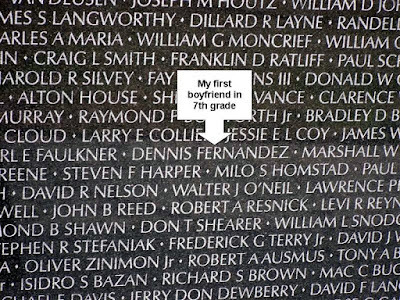 I actually found the name of my first childhood boyfriend from 7th grade at Burton Junior High on that wall, Dennis Fernandez. He was a tall, thin, blonde young man with a twin sister. I attended my first junior high dance with him. I even remember the name of the song that was playing while we danced: "Wonderland by Night". Rest in peace, Denny. Back at the hotel, we were meeting my childhood friend Ingrid and her husband Jake, who were driving in from New Jersey for dinner and the show that night. Ingrid's family and my family came over on the boat from Germany together. Both our parents' worked together at Seabrook Farms for a year and then we moved on to Michigan. Her family stayed in New Jersey. We remained childhood penpals, stood up at each other's weddings and see each other every few years. After visiting with them in our room for awhile, we drove to Legal Seafoods for dinner, where we were meeting a fellow Kunze fan from the internet. Her name is Beth and she is a violinist who has accompanied Eric many times as an orchestra member during his shows. She had never seen him perform as an audience member and had never met him in person. The concert was just as good this night as the previous. Eric has a way of making eye contact from the stage so that you feel connected to him while he is performing. That is why I love to sit in the front row. Also, because although I am very self-conscious about it, I always make a point to give him a standing ovation at the end of the performances. These days, most performances are rewarded with standing ovations, whether they should or not. Eric's shows always deserve them! A funny thing happened during intermission. I was standing with my back to the stage looking at the auditorium when a couple came up to me and asked if I was Maggi from the fansite. They recognized me from the photos and introduced themselves as Eric's aunt and uncle! They were just as nice as the rest of Eric's family and Eric himself. After the show we all went round to the stage door and they insisted on a photo with me. 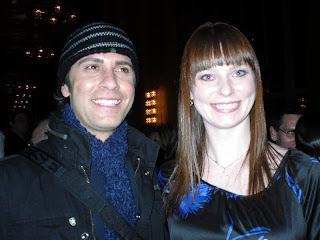 Beth got to meet Eric, finally, and like everyone else who meets him in person, was enchanted. Afterward, we all sadly parted our separate ways. Eric and his family in one direction, Beth in another, and Ingrid and Jake drove Jan and I back to our hotel. They faced a three hour drive back home to Jersey that night. As Ingrid said that night, "You only live once" and this occasion was certainly worth the extra effort!